Doreen's escape is ruined. Ian and Meg have a drink and Meg makes it very clear to him that she is not interested in him at any level, except as a colleague. Steve arrives on the scene and tells Janet to move slowly away from the dogs. Doreen sees an armed gate guard aiming his rifle and calls the dogs to her to save them from being shot. She comforts them and comes back through the fence, realising that she has thrown away her chance to escape. Janet refuses to go home but Erica insists. 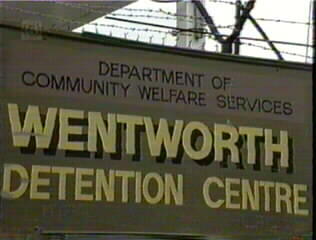 Finding that Doreen has been locked in her cell, Erica tells Steve to move her to solitary to await the VJ. Judy drives her taxi to Wally's cottage, finds the door open and sits down to wait for him. Sandy tells Bea she thinks they should move in on Marie, but they stop their conversation as Kate glides into the cell. She realises they have stopped because of her and is offended, insisting that she's not on Marie's side and just wants a quiet life until her appeal. After Kate leaves, Bea tells Sandy what the doctor in hospital told her about Kate and Conrad. Wally arrives home next morning (minus beard) and at first assumes that Judy has escaped again. Marie tells Kate the drugs will be "the real stuff" next time and that in return McNally has hinted that he wants Sandy killed. Kate mentions that she's already sneaked some barbiturates out of the infirmary. Doreen's absence is noticed at breakfast. Marie challenges Bea in the dining room, but as soon as Sandy stands by Bea, Lil and Bev suddenly melt away from Marie's side. Janet tells Bea that Doreen is in solitary but refuses to say why. Erica questions Doreen about the escape, but appears to reconsider sending her before the VJ when Doreen points out she saved Janet from being attacked by the dogs. Doreen is nevertheless taken back to solitary. Marie tries to heavy Hazel into buying some pills, but Sandy knocks her to the ground when she sees what's going on. Unbowed, Marie catches up with Hazel later and gives her some pills "on account". Judy agrees to come back to Wally's to stay after she has returned the taxi. Hazel tells Bea that something Marie said makes her suspect that Sandy's life might be in danger. Sandy and Bea go straight to Marie's cell and "add a few finishing touches" to the decor by trashing it: Marie watches in silent fury. Kate arrives just after they have finished the makeover job: Marie tells her that they must get rid of Sandy to pull Bea back in line and that she expects Kate to get something from the infirmary to "weaken" Sandy. Kate suggests a mixture of barbiturates and emetics (probably hoping that Marie will not understand what an "emetic" is!). Erica tells Janet she's decided not to proceed with the charges against Doreen. Colleen stops Kate in her tracks when she's about to ask a favour and points out that Kate has hardly kept her side of the deal. A policeman arrives at Wentworth trying to trace Judy after Jock is found in a coma: Erica suggests he goes to speak to Meg. Meg meanwhile is trying to fend off Ian in the pub where they are supposed to be discussing work. Lizzie persuades Janet to let her take Doreen's teddy bear to her in solitary. Meg leaves the pub in a hurry when Ian turns the conversation in a rather too personal direction, and arrives home to find that Bob has returned early from his business trip: he is keen for her to come back with him to Jakarta, but she refuses to agree until she's had time to consider. The arrival of the policeman looking for Judy does nothing to help Bob's mood. Kate asks Colleen to move her to the infirmary to get her away from the infighting: Colleen points out that this will mean she will be even less likely to get her any information but agrees to ask Erica. The police officer explains to Meg that they have a witness to Jock chasing Judy out of the flat, so they only want to see her to confirm her side of the story: Meg suggests he might try her friend Pauline. Meg wants dogs to be removed, but Erica tells her the Department have already agreed to this. Colleen sees Doreen has the teddy bear in solitary and tries to confiscate it, but Doreen insists Erica had given permission. After giving Janet a roasting for breaking the rules, Colleen returns to solitary and takes away the teddy bear. Erica tells Meg she is pleased to see she has applied for the Deputy Governor's post, but Meg says she isn't sure now if she will proceed with it. Doreen hears barking outside and climbs on her bed to see the dogs being loaded into a van. Colleen turns her back while Kate is putting some out-of-date drugs from the dispensary into the garbage bin and doesn't see her slipping them inside her jacket.